A Haitian woman arrives at the office of Leduc Detective proclaiming that she is Aimée Leduc’s sister, her father’s illegitimate daughter. Aimée is thrilled; she has always wanted a sister. Her partner, René, is wary of this stranger, but Aimée embraces her. 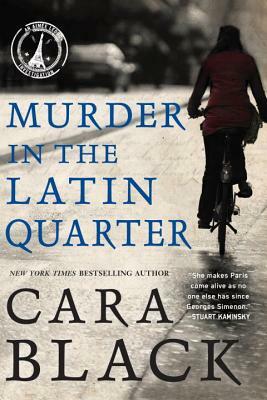 She soon unearths a secret that leads her to a murder in the old university district of Paris, the Latin Quarter. "The ninth mystery in Cara Black's irresistible series set in Paris . . . might well be the book we've been waiting for. Aimée Leduc, Black's adorably punkish sleuth, is in her element." "Kinsey Millhone turned loose in Before Sunset . . . In Leduc's ninth outing, Paris, as always, sparkles in all its gargoyled, dusty, cobblestoned glory." "If you were weaned on the feminist PIs of the '70s and '80s like Sara Paretsky's V.I. Warshawski and Marcia Muller's Sharon McCone, you may be looking for successors. Cara Black's series set in Paris is worthy." "Black at her peak, with rich historical background and a vivid sense of place supporting her compelling narrative."